The proactive role of Live Performance Audience. On 22th and 23th November The Be SpectACTive! Project Annual Conference was held in Barcelona and was hosted by the University of Barcelona, which is also partner of the project. Be SpectACTive! 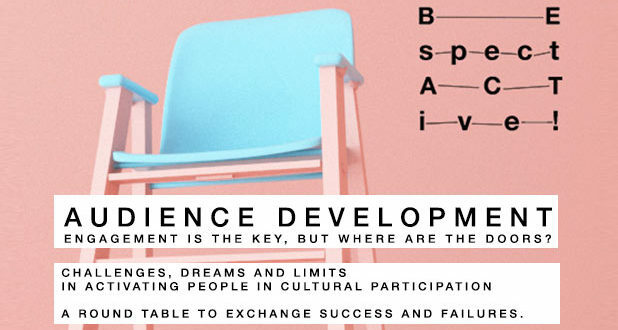 is a European project based on audience development, involving some of the most innovative European organizations working on active spectatorship in contemporary performing arts. Its members are European festivals, theatres, universities and a research center. The two days event brought together professionals, practitioners, experts, artists, associations and organization in the field with the aim of debate the relationship between arts and participatory practices. The programme was organized in a series of keynote presentations, held by experts and academic staffs that investigate the role of audiences in the artistic practices both by practitioners and festival organizers that told their experience and good practices. Beyond the keynote sessions, the core of e SpectACTive consisted in series of participative workshops through which topics such the residencies, the artistic programming, the art management were encompassed with the challenge of actively involving the audiences. the experimentation of artistic creation based on the creolisation of diverse European national theatrical traditions. the participation of the audience in a joint complex work of both cultural production and identity setting around cultural intangible assets. Leaders has to be relational (and not charismatic). Playing Identities Performing Heritage at The Be Specatative! Coference in Barcelona.